Rick Mercer's Blog: Should He Stay or Should He Go? After the last election Stephen Harper took a lot of grief for putting a guy who had never been elected directly into his Cabinet. I was as surprised as anyone, really. 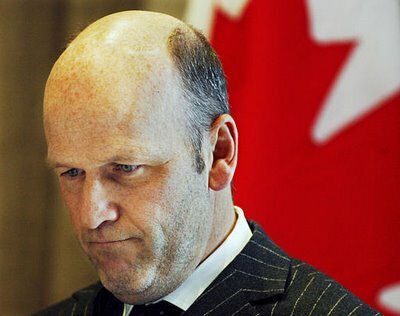 It seemed odd that Harper, a man who had railed about the evils of the unelected Senate for his entire career, would appoint his buddy to the Senate and then directly to Cabinet within hours of becoming Prime Minister. As far as optics goes, it doesn’t get much worse. This is exactly the type of thing that bugs most Canadians about politics. I’m pretty sure they would prefer that Cabinet ministers actually get elected by the people before they buckle down and start running our lives. To be fair, I do believe that in extraordinary circumstances a Prime Minister should be able to pass over his own MPs and put non-elected people into Cabinet. If Canada was at war and nobody in the House knew anything about the military, it would make sense that the PM be allowed to call up an expert on the Canadian Forces and have them join the Cabinet. Or imagine being Stephen Harper and you wake up the morning after winning a general election only to realize that the vast majority of your MPs just aren’t smart enough to be in Cabinet. It makes sense that you should be allowed to call up your buddy in Quebec and give him a Cabinet position. This is, of course, an old boys’ club, and so this is exactly what the Prime Minister did. Instead of giving the job to an elected Member of Parliament like Diane Ablonczy he called up Michael Fortier, private citizen, and gave him the big gig. I don’t mean to minimize Fortier’s abilities. The man is head and shoulders over most of us. He is a highly accomplished lawyer banker type of creature and back in the day was co-chair of Harper’s national leadership campaign. And it’s not fair to suggest he has never run for anything; in 1998 he ran for the leadership of the Conservative party and came in an impressive last with over four percent of the vote. If that doesn’t scream future senator, I don’t know what does. The ego perks of the gig are enormous. Fortier has never had to suffer the indignity of standing on a doorstep and asking a person for their vote, and yet everyone in Canada is supposed to refer to him as “the Honourable Michael Fortier” for the rest of his natural life. And when, God forbid, he finally passes away, the flag over the Peace Tower will be lowered to half mast to honour his contribution to democracy. By the way, I’m not suggesting that giving his pal the gig was an easy move for Harper. It can’t be easy having to look your MPs in the eye and basically tell them they’re imbeciles. Even for Harper that’s got to hurt a little bit. And pity the poor caucus. Imagine getting elected, your party forms the government, and then your leader basically tells you that you have a better chance of ending up with a disability cheque based on your mental incompetence than you ever do of seeing a minister’s salary. That’s a tough day at the office. That was the situation we had in Canada. But all that has changed. The Prime Minister has called a by-election for the Montreal-area riding of Repentigny on Nov. 27. The people are going to the polls, baby! Democracy in action. One would think that Michael Fortier, being the honorable type, would jump at the chance to stand for election. Nope. Fortier says he has no interest in running for the seat. The man is content to continue being a Cabinet minister without having to go through the rotten business of asking people to vote for him. And for some reason the Prime Minister seems content to have unelected people in his Cabinet. This might not be Denmark, but something stinks. Canadians might not think much of politicians, but last I looked we do have a say in which ones run the country. The basic definition of democracy is “one woman one man one vote.” The time has come for Michael Fortier to be man enough to ask Montrealers for theirs. Luckily the Internet is a wonderful way for Canadians to voice their opinion on such matters — whether it is being asked for or not. So through the miracle of the Web I have set up two petitions directed to the Prime Minister. One, titled “Run Fortier Run,” suggests the time has come for The Honourable Michael Fortier to run for a seat. The second, “Stay Fortier Stay,” supports the Prime Minister in his contention that Fortier should remain an unelected Cabinet minister who sits in the Senate. Ladies and gentlemen – start your laptops. May the most bitter team win!